As the weekend rolls up, riders are beginning to dust off their bikes for the March riding season. 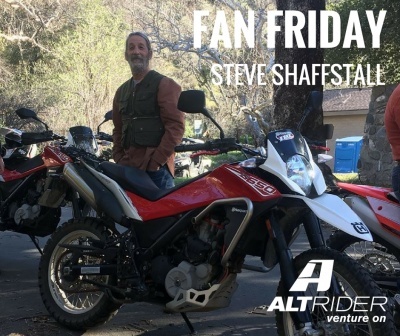 This Friday we sat down with AltRider fan Steven Shaffstall, 63, to talk to him about his riding experiences around Southern California and why he trusts his latest two-wheeler to be protected by AltRider. He started riding at the age of 12 in Glamis and purchased his first bike, a Harley-Davidson 350 Sprint, in 1970 at the age of 17. He’s been hooked ever since. From cruisers and dual sports to dirt bikes, three wheelers, dune buggies and quads, Steve had quite a few toys over the decades. His pride and joy is a 1986 Honda ATC 250R which he still romps around the dunes, and he is in the process of fixing up a 1988 Honda CR500 to take to some vintage motorcross races. The bike he spends the most time on these days is his 2013 Husqvarna TR650 Terra, which he rides around the back roads of Orange County to biker stops such as Cook’s Corner, as well as up north into the Sequoias, Big Sur and Death Valley with his wife, Pamela. Steve’s done a lot of riding in the past five decades, covering almost every inch of California and the western states. 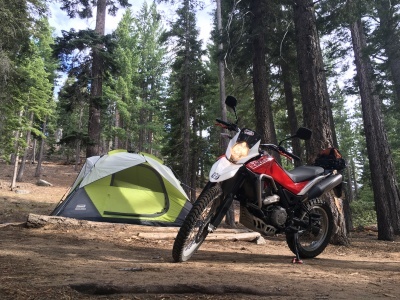 He has his eye on a KTM 690 Enduro or an Africa Twin for his next ride, and plans this summer to ride the Eastern and Western Sierras all the way through Oregon. After his wife retires this year, he is looking to conquer the Continental Divide up through Canada and into Mexico. But when it comes to his ‘dream ride’, he’s really not picky. We like that attitude. Make every ride your dream and as always, venture on. Comments by non-Altrider.com members must be moderated and may not appear immediately.